Cheap Diagnostics with a Portable "Paper Machine" | Technology Networks Cheap Diagnostics with a Portable "Paper Machine"
Cheap Diagnostics with a Portable "Paper Machine"
In the U.S. and other industrialized nations, testing for infectious diseases and cancer often requires expensive equipment and highly trained specialists. In countries where resources are limited, performing the same diagnostics is far more challenging. To address this disparity, scientists are developing a portable, low-cost “paper machine” for point-of-care detection of infectious diseases, genetic conditions and cancer. Many modern diagnostic techniques involve analyzing DNA in a patient’s blood sample. If pathogenic bacteria, for example, are present, the test will detect the foreign genetic material. Part of the barrier to bringing this kind of technology everywhere is that it often requires multiple steps under precisely controlled temperatures to prepare a sample and analyze it. Scientists are working to simplify these procedures, but most are still not ideal for remote locations. John T. Connelly and colleagues set out to make this critical technology more accessible. 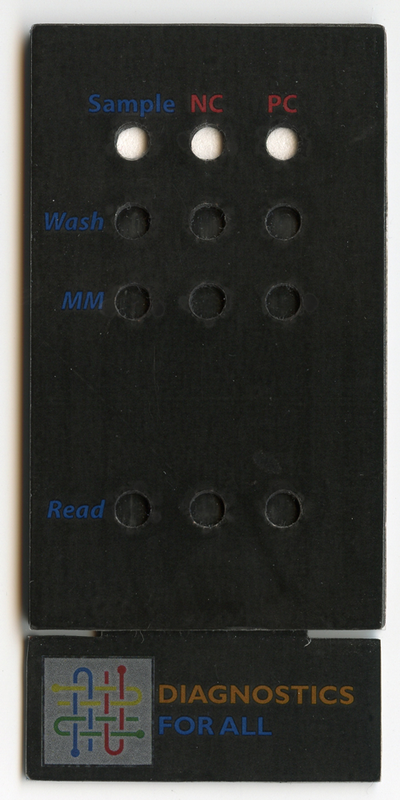 Using materials that cost a less than $2 total, the researchers condensed sample preparation, DNA analysis and detection steps into a hand-held paper machine. It successfully determined whether as few as five cells of E. coli were present in test samples. The results can be read using ultraviolet light and a smartphone camera. The researchers say they are further refining the machine to make it even simpler to use.